We really need some centering rings for the Osram Flat Whites to fit the L2, C8 and S2’s. Anybody try one yet? He also has 1mm WF’s listed. The xml smo c8 reflector is 7mm but all the c8’s with xpl hi came with larger 9mm holes. Im not sure about the L2..
That was way back then. Now the XM-L2 version also 9mm. I got a 3 piece batch few months ago with XP-L HI and 7mm reflector holes and different centering rings but that was one time only. All others 9mm. L2 has the same 9mm centering ring as C8. Hey gang, I’m trying to catch up on this Osram CSLNM1.TG emitter by reading through the majority of this thread. I’ll admit, some of the info is beyond me. I have a clear anodizing C8 host sitting around I’d like to try out a Flat White CSLNM1.TG emitter in. But I have a couple of questions. I would like to run this with a very well regulated driver. Djozz’s graph says 4.5A-5.5A is the sweet spot. Anyone have a US retailer that supplies that? Or is Led4Power going to be my best place to get one? I may try this out in my Jaxman Z1 (Cometa) which needs a 22mm driver. What have you guys been using in this case? Black flat needs insulating. White flat is like most LEDs. No issue. Above driver configured with less 7135 will be good for Z1. Edit: not sure if u can use retaining ring with that one so ymmv. Thanks for the help Contactcr! Thanks a lot for this data Enderman. I tend to define efficient thrower LED as one that gets high intensity (cd/mm²) while retaining good efficiency (lm/W). I asked myself a question: how does a collar affect efficiency? Not efficiency in combination with a well matched aspheric; there the answer is easier. Efficiency of emitter-collar combo. Collar reduces lm/W. It increases cd/mm². Emitters tend to be very inefficient when driven to top currents. That’s especially true with Osram thrower LEDs – because they can be overdriven much harder than any other LED BLFers have tested. If they are driven with lower current they are much more efficient. The thought was: the top intensity that emitter achieves is a mild one for a collared one. Will the output loss caused by the collar offset by better efficincy of the LED itself? Thanks to your data I was able to answer this question (note: I estimated lumen. My estimation ignores light that passes through collar and reflection off collar edge). The answer is “probably no”, collared LED is not more efficient. At 0.96A your collared LED does about 56 lm/W and 227 cd/mm². Emitter alone can reach 247 cd/mm² with 87 lm/W. At the peak emitter alone does 56 lm/W and 334 cd/mm² (awesome result! L4P measured 285 cd/mm² at 47 lm/W and djozz measured even less). The closest point of collared LED is 45 lm/W and 387 cd/mm². For the curious: at the peak a collared LED does 24 lm/W. Collars can only be used with lenses. The angle of light that will hit the lens will not change whether you use a collar or not. So essentially the lumens that the LED puts out is irrelevant. What matters is the lumens that actually hit the lens and come out of the flahslight. By doubling the intensity of the LED, a collar also doubles the flux output from the lens, doubling the effective lm/W. If the LED is doing ~50lm/W at 5.5A only 25% of that will be captured by a lens that collects 30 degrees. The collar will double the intensity as well as the collected luminous flux, giving ~25lm/W. Just thinking out aloud here… if you had a small enough collar with a large enough parabolic reflector in a recoil configuration where the focal length the parabolic reflector was long enough to use a collar, would there be a benefit? This is over-simplified, doesn't it? 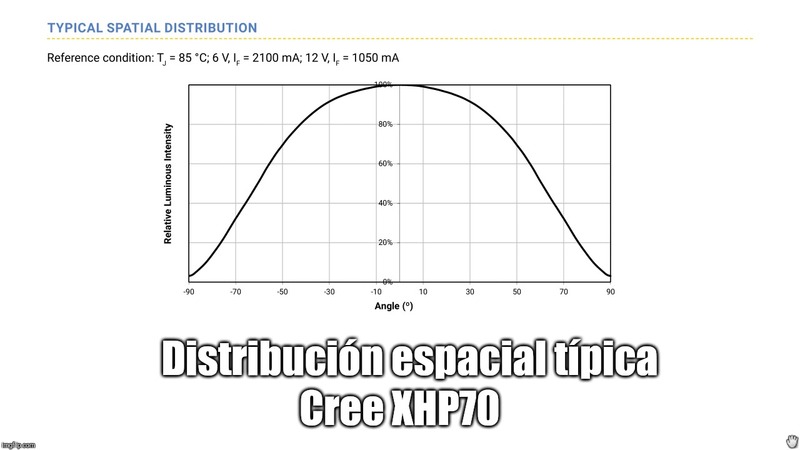 Typical emitter datasheet spatial distribution graphs reveal the light intensity is higher at the center and decreases gradually with increasing angle offset. This means emitters deliver most of its light out the front. Topmost 60° out of an XP-G3 are above 90% relative intensity, whereas at 120° cone borders we're already below 55%. The main reason to use recoil is to collect almost all the light of an LED into the beam though, and using a longer FL reflector with a collar does the opposite. This is over-simplified, doesn’t it? Typical emitter datasheet spatial distribution graphs reveal the light intensity is higher at the center and decreases gradually with increasing angle offset. This means emitters deliver most of its light out the front. Topmost 60° out of an XP-G3 are above 90% relative intensity, whereas at 120° cone borders we’re already below 55%. 30 degrees half angle (60 full angle) is 25% of emitted light from a lambertian distribution. This already takes into account the higher intensity at smaller angles. That is why 30 degrees is 25% of light, and 60 degrees is 75%. You’re basically replacing a lens with a recoil reflector, yes you can do that and get the same 2x benefit with the collar, you just need a recoil reflector that has NA0.5 The main reason to use recoil is to collect almost all the light of an LED into the beam though, and using a longer FL reflector with a collar does the opposite. Just thinking in terms of practicality too. I understand about having the shorter FL, but then you’d need a very large reflector. If one set the FL so that the diameter of the reflector coincided with the 30 deg. half angle of the emitted light, then the RLT would “catch” the rest and give the most intense beam with the smallest possible reflector. Or not? I was toying around with the exact opposite of a collar – a spherical reflector with a hole in the middle that encompassed the angles where “spill” would occur. Basically the angles that the light does not hit the reflector. I was actually doing this in an attempt to reduce glare in an outdoor spotlight build. But what if we could take that spill light and reflect it back somewhat onto the LED? My test setup was not the best – I was using an undomed BLF GT70, the spherical reflector was hand-made and polished, and the lens was Lexan with an aperture for adjusting the FL of the spherical reflector. I was able to get the spill to almost nothing, but did get some rings around the hot spot. There’s a bevel on the edge of the reflector I made (a drop-off from a large DIY RLT collar) that possibly caused this. Did not do a lux reading before and after because it was cold, and I was too lazy to set the GT70 on a stand. The hot spot did look a little more intense, but hard to tell definitively. The other thing I was thinking of… there are quite a few “hybrid” reflectors that have TIR optics – either molded as a whole, or as an assembly. Wouldn’t there be a way to create a side emitter TIR that could work with a reflector, retrofit based on its geometry? Using a collar with a longer focal length reflector would simply mean you can have half the front area and get the same lux. That means that the diameter is ~30% less. If you’re going for highest lux, then you choose a diameter FIRST, then decide if you want short or long FL. Having a long FL (in order to use a collar) means that the light assembly needs to be much bigger. Think of the syniosbeam, but instead of being 4” thick it needs to be 12” thick. That’s almost a 1ft cube, way bigger than having a short FL. I was toying around with the exact opposite of a collar – a spherical reflector with a hole in the middle that encompassed the angles where “spill” would occur. Basically the angles that the light does not hit the reflector. A collar is literally a hemispherical reflector with a hole in it. I think you mean a concave spherical mirror without a hole in it. The main reason people don’t do it is because the best case scenario is 1.11x intensity, since typical reflectors like the GT collect between 30 and 90 degrees, so ~75% of the light, which leaves only 25% to be recycled by the collar at 33% recycling efficiency (based on the normal collars which collect 75% of light and turn the remaining 25% into 50%). So a lot of work for 11% increase is not worth it. Using a collar with a longer focal length reflector would simply mean you can have half the front area and get the same lux. That means that the diameter is ~30% less. That’s not a lot. Now I’m lost… You just mentioned earlier that ~50% of the light from a Lambertian emitter comes from the front 60 degrees. That leaves ~120 degrees to collect the other 50%. In other words, while the surface of the parabolic reflector is collecting more light, that light is less intense. So, if we have a “thrower” flashlight with a beam divergence of around 4 degrees, then about 44% of the total light the LED puts out is going toward spill. Which also explains my theory for having an aperture in the spherical reflector – since 4 degrees of that “spill” light is actually going into the beam. So at 33% efficiency, that’s a 15% potential increase. For a cheap concave mirror, tube, and lens with a hole in the middle – probably about $3 in parts. 1) you need to think about volume not just diameter. This has nothing to do with beam divergence. A typical forward-facing reflector collects between 30 and 90 degrees, aka 75% of the light. That leaves only 25% of the light to be recycled. As opposed to a 0.5NA lens which collects 25% of light, leaving 75% to be recycled. I think it is possible to design a reflector with a particular shape suited to match a crowning aspheric lens beam converging wise. Of course it should. There are many optics that work with LEDs. Some of them don’t work well with a collar. But I didn’t mean to fix this parameter. For example it makes sense to compare LED+TIR to LED+collar+aspheric. Or one can compare out-of-focus zoomie performance. For me LED+collar together make an emitter. That emitter has limited emission angle. And it has a power-performance curve. I was interested just in that curve. Actually I didn’t end up drawing it because the numbers above turned out to be enough for me. Let me try this again… if the typical forward-facing reflector is capturing between 30 and 90 degrees that’s 66%. But If 25% of the lumens are emitted between 0 and 30 degrees, that only leaves at most 25% of the lumens hitting the reflector. In other words, the light hitting the reflector overall is half as intense as the light not hitting the reflector. So with an RLT collar with a 30 degree half-angle aperture, while it’s recycling 66% of the emitted light, it’s only recycling 50% of the lumens, of which is about 33% efficient. Or in other words, with RLT, about 16% of the total lumens gets reflected back into the LED. If I remember correctly, someone made a build with a parabolic reflector with an aspheric lens “floating” in the center in an attempt to capture and redirect the “spill” light. There are “hybrid” reflectors that do this on the market, as well as reflector/TIR hybrids. I had also considered (and may still try) a floating “zoomie,” though the rear-facing spherical reflector was easier and faster to make. Pretty nice focus with my handmade gasket from POM plastic. Centering is slightly off. From around 40cm to the wall I get a hole in the hotspot and from 3m the hotspot looks a little like a flower. Does this mean the focus is good? Yes, that is a good sign. I just received a D1 and this is my assessment too. It seems the reflector has significant deviations from parabolic. Even with the larger XPL HI I couldn’t get the focus right; the inner part of the reflector was not reflecting the die. 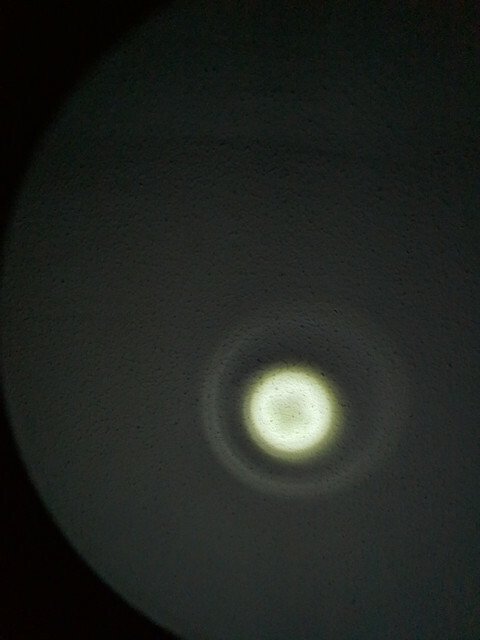 I put a 2mm^2 white flat in and the focus problem was made a bit worse. Stock XPL HI V2 3A @ 5.4A: 44.9kcd. 2mm^2 white flat at 7.9A (30Q at 3.66V): 79.2kcd. As the beam is now, the hotspot is the same size as an EE X6 with dedomed SST40, but with a much smaller corona than the X6. The focus could maybe be improved by a little. Current measured with ~2mOhm shunt at the tail and clamp meter. I continued this mod by adding some resistance in the same style as I did with my D1S in a post above, by adding a length of nichrome resistance wire. But with the D1 there is not enough room for a length of big wire like I used. I found some nichrome 80 ribbon wire (0.8mm wide, 0.1mm thick) with 4.15 ohms per foot. 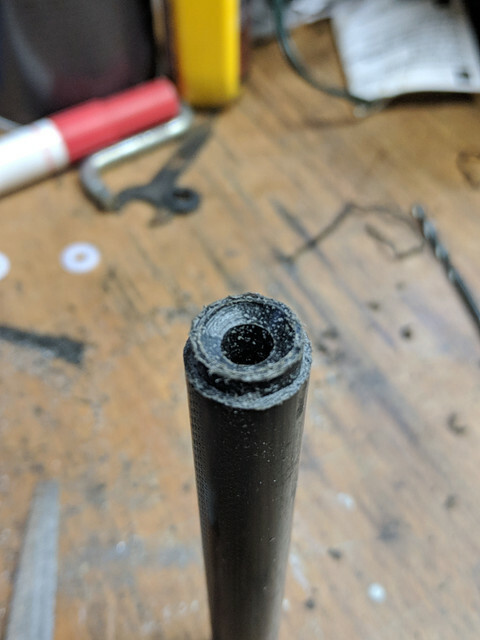 With its higher resistance and flat shape I figured I could fit some into the tailcap and make electrical contact with the battery tube pressing on it. You can’t solder to it so I needed pressure to make the electrical contact. I made a PET plastic gasket that mostly covered the ground ring of the PCB, then made cutouts for the ribbon wire so the battery tube makes contact with the ribbon wire only, then the other end of the ribbon wire makes contact with the ground ring. I used two pieces in parallel and it makes around 0.1 Ohms. I used thermal adhesive to keep the wire segments in place. This arrangement made it difficult to measure the current, so I used the gas tank method (charging the cell then discharging in the light for 1min, then charging again and measuring the input mAh) with my reactor 300W charger. I got 6.2A average current over the minute with a charged 30Q. The cell was cool so I would probably get a bit more current with a warm cell. Edit: with a charged cell (4.12V) I put in my pocket to warm up, I measured 72 kcd. I talked about WF1 with Simon a week ago and he told me he will get some testing samples after chinese new year and maybe consider putting them in C8. I will help him in every way I can after my 6-7 WF1 builds conclusion and led measurements. The amount of light collected is not linearly proportional to the angle. 0 to 30 degrees is 25%. 30 to 90 degrees is 75%. The amount of light collected is not linearly proportional to the angle. 0 to 30 degrees is 25%. 30 to 90 degrees is 75%. 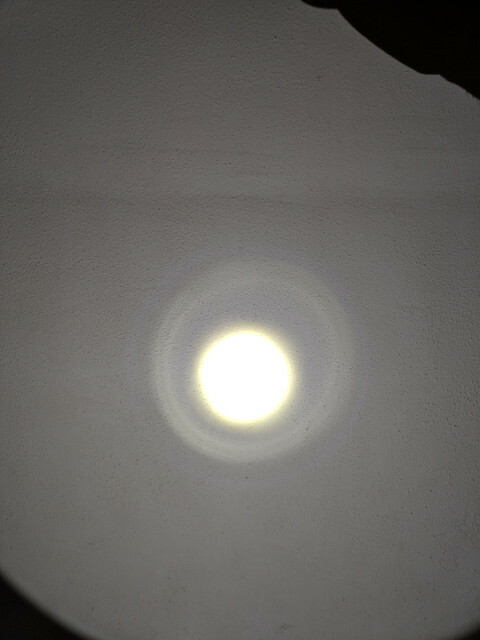 Still, the relative luminous intensity of the LED from 30deg. to 0deg. is around 90%-100%. From 30deg. to 90deg. it ranges from 90% down to <10%. So putting a spherical reflector with a 60deg. arc in front of the LED captures the most intense light and reflects it almost straight down onto the LED (so I would hazard to postulate the efficiency goes up), whereas an RLT is capturing a light that’s, I’d say on average 50%-60% of relative luminous intensity. That said, RLT with optics are easier to implement; however getting a Wavien collar is not so easy. I’ve made a few for experimenting however. I think having a downward-facing spherical reflector has some merit still; even though it takes more tuning, it is a relatively easy mod, and in one wished, precision spherical reflectors can be easily obtained from Edmund Optics or ThorLabs… Using the GT70 as an example – even if I could get only an 11% gain – can you think of any other mod I can do that I can gain 11% and still have money left over for gas and food? According to what I can infer from a typical spatial distribution graph, the integral of the first 30° half angle cone has nearly the same surface (≈14,6 squares) as the remaining 60° half angles (2 × ≈7,5 squares = 15 squares). To me this means the first 30° half angle cone (60° frontal cone) delivers 14,6/29,6 lumens = ≈49,324% of the total output. As I see it right now, of course. Edit: Had a very quick read at Lambert's cosine law @ Wikipedia, suffice to say there's a lot there which is out of my league but still, the first half 30° angle looks to be ⅓ of the output and the remaining 60°, ⅔ LoL. Edit: Had a very quick read at Lambert’s cosine law @ Wikipedia, suffice to say there’s a lot there which is out of my league but still, the first half 30° angle looks to be ⅓ of the output and the remaining 60°, ⅔ LoL. Yeah you need to take into account that the LED emits in a hemisphere, so even though angles close to 0 are more intense, the circumference of the circle at that angle is small. Luminous flux depends not only on intensity but on intensity and area, which you probably found out when reading about Lambertian distribution. The graph with the lobes shows that at 0 degrees there are 0 lumens emitted, because the area is 0 even though intensity is max. Also at 90 degrees there are 0 lumens because the intensity is 0 while area is max. You need to take the area integral of this lobe graph, not just the spatial distribution that is on LED datasheets. Read my post above, you need to take into account area, not just intensity. Think about measuring the lux from an LED with the luxmeter at the end of a 1m long stick. When you move around the hemisphere there is a lot more places the luxmeter can be when you’re near 90 degrees. When the luxmeter is right in front of the LED, there’s only one spot. thats a great explanation enderman. I too have been thinking intensity but your analogy perfectly set my imagination straight. sometimes things are that easy. Well, the lux meter can be 30deg. to either side of the central axis of the LED and still read 90% luminous intensity of dead center. I found a calculator online and found the surface area of a parabolic reflector for a front-facing LED whose diameter is the approximately the same as the distance from opening to focal point about four times that of the surface area of the opening. But even though the surface area is four times as large, the light intensity I would estimate to be about 2/3 that of the light emitted from a 30deg. to 0. And the efficacy of an electroformed parabolic reflector surface with rhodium coating is around 90%; I’m sure the cast, machined, and polished/coated surface of say a BLF GT to be slightly less. So maybe the ratio of light from the reflector versus light directly from 0-30deg. is more like 2:1 rather than 3:1. But the reason for using these emitters is to effect a longer throw, not to put the light on an integrating sphere to get a lux reading. Your very own OptoFire uses that 30deg. half angle since that’s the aperture size of the RLT you used,. And the lens is approximately the same size as the reflector on the GT – yet it throws farther than a Black Flat installed in a GT with a reflector – despite the GT’s reflector having over four times the surface area of the RLT collar you used. A collar which you noted is about 33% efficient at collecting light from 30deg – 90deg. So using your theory a larger collar (with the same aperture angle) would be more efficient – but I don’t think so, because any errors on the surface would be greatly magnified dur the distance of the reflector from the LES. But for a larger emitter it may be beneficial.